All culinary traditions have ways to make small amounts of food stretch. I wanted to borrow from a few different traditions just to experience the range of different types of foods that can be made cheaply. And I didn’t want to get bored. My big plans involve my family’s Serbian stuffed cabbage, some enchiladas, and Vietnamese style rice porridge. Other than those, I plan to improvise over the week. 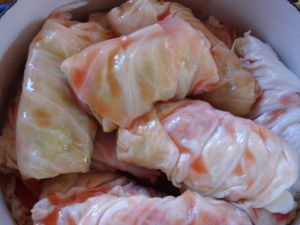 So the plan is to make the cabbage rolls and cook them the day before the challenge starts. 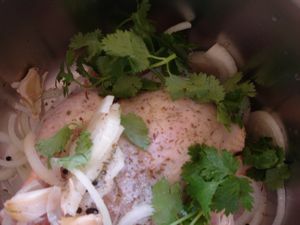 I also decide to poach a whole chicken and then tear the meat off the bones and strain the broth for later use. This was a necessary because I needed to have food ready to go for Day One. It promised to be a busy day—one in which I work away from home, go to Spanish class at night, and don’t get home until 9pm. I had to be ready. I cooked the rolls as planned basically using this recipe from my family files. But I did a few things differently to streamline. I used less meat and more rice to make it cheaper, and I cooked it on top of the stove instead of in the oven, I used canned tomato sauce, and I omitted the sauerkraut. Here’s the reworked recipe. Bring about 3 inches of salted water to boil in a large pot. Core the cabbage and put it in the pot with the lid on. Cook for about 12 minutes, turning once. Remove and drain until cool enough to handle. Reserve the cabbage water. In a large bowl, mix together the beef, rice, onion, egg, salt, and pepper until just blended. To stuff the rolls, carefully peel the large leaves from the head of cabbage. With a paring knife, trim the large vein at the back of the leaves to make them more pliable. Lay them out on a flat surface. Spoon out about 3 tablespoons of the beef mixture into each leaf, depending on the size of the leaves. Fold two ends of the leaves inward toward the filling and roll each leaf up like a burrito. Select a lidded, burner-safe casserole dish large enough to accommodate the rolls. Line the bottom of the casserole dish with leftover cabbage leaves. Top with the rolls, layering them. Pour the tomato sauce into a medium bowl or large, glass measuring cup. Using the empty can, measure an equal amount of cabbage water and pour into the sauce. Stir to combine and pour the thinned tomato sauce over the cabbage rolls. Place the casserole, over medium high heat, and bring to a simmer. Lower heat to medium low, cover partially and simmer slowly for 1 1/2 hours. You’ll want to watch them but the cabbage leaves that line the casserole should keep the rolls from sticking. A poached whole chicken is the easiest, most rewarding thing in the world. You can leave out the spices, but they do add a lot. I figured my cushion allowed me to use them. The $1 bunch of cilantro I bought served me well, and would continue to throughout the week. Put the whole chicken in a big soup pot. Add the remaining ingredients. Add water to cover the chicken by one inch. Bring to a boil over medium high heat. Lower heat to a very slow simmer. Cover and cook for 20 minutes. Turn off heat and leave the pot covered and undisturbed for 1 hour. Remove the chicken from the broth. Cool and shred. Strain the broth and refrigerate. This entry was posted in food justice, hearty, hunger challenge. Bookmark the permalink. Post a comment or leave a trackback: Trackback URL.